Today i am up .5 pounds from yesterday for a total lose of 12 pounds since the start of this trial. I am keeping this short and sweet because i am exhausted. I have been staying up late, being active, and waking up earlier then usual. Burning the candle at both ends, i am exhausted. Today i did alot of preparing some food to hopefully make food prep take less time during the week. I will post pictures of this stuff when i am not dead girl typing. Today, i went to a farmers market. They had a raw food chef there who makes this amazing spicy cone. He makes flax cracker in the shape of an ice cream cone and fills it up with yummy veggie and sauce mix. It was mouth watering. I am going back next Sunday to get another one. I had this cone for breakfast. For lunch, i had a tomato avocado plate. For dinner same thing, plus a couple not meat balls with pesto sauce. I also had grapes as a snack. I put my family to work in the kitchen today. Mom chopped and juiced lemons and limes. Lindsay rolled balls and mixed, i played comedian as well as explained to them what to do and ran the food processor and blender. This is rainbow salad with a tangy dressing. I really liked it. However mom and lindsay thought the dressing was too tangy and needed something else. They dont know what that something else is so i am going to experiment later in the week. The salad is carrots, kale, and cabbage. 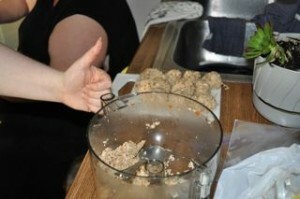 Here is lindsay giving herself a thumbs up for her ball rolling. This is insane coconut. It is really good Basically, almonds, dried shredded coconut, agarve, salt, and coconut oil with a touch of vanilla. This is the beginning of chocolate balls. 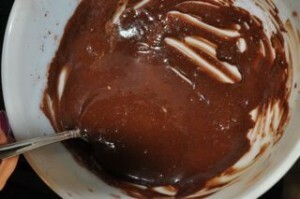 It is the chocolate goo that holds it all together. 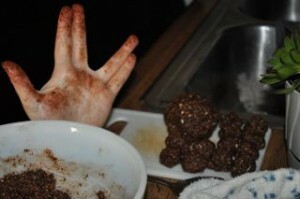 Anyone who loves dark chocolate would love this. Lindsay giving us the star trek sign. 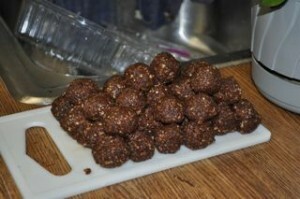 She was rolling the chocolate balls and she pretended to roll a huge one just to see if i would notice. This was everone’s dinner. The big plate in the middle is moms. She has raw pasta with pesto and not meat balls. 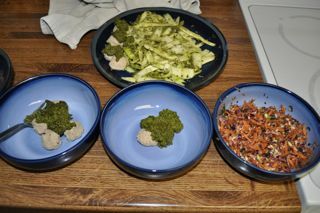 Lindsay had the bowl on the left with a few not meat balls and pesto. I had a couple not meat balls and some of the rainbow salad. I think tomorrow, i will put some thin slices of tomato on the salad. Well hopefully, it is off to bed with me. This morning I woke up a bit later than usual, I figured it was Sunday so I could get away with it. I was feeling a bit better this morning, but have slightly digressed this evening. This week I am going to be consciously taking a look at what I eat and how I feel afterward. Included in this examination will be what occurs else where in my life to allow for non-food elements. One thing that I think is helping is that this week I was better about getting exercise…I really missed it. I had forgotten how good I feel when I work out regularly. I spent the morning eating my regular foods: oranges, tomatoes, and avocados. However, this afternoon my day got switched up a bit, in a good way. While making lunch, Mum was sweet and made me a plate of red bell peppers and strawberries. I realize that may sound like an odd combination, but they went together quite well, and I loved it. Adrienne, Mum, and I did a bit of a marathon in the kitchen this evening. Adrienne made pesto, meatless balls, chocolate nut balls, coconut-almond awesomeness, as well as something I had never tried before, rainbow salad, which wasn’t my favourite, but still good. 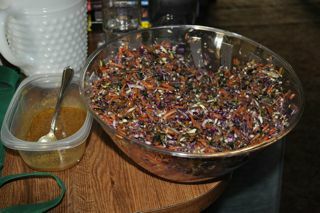 Rainbow salad consisted of green and purple cabbage, carrots, kale, and some other stuff, with a lemon flaxseed dressing. It was a blast getting to work with Adrienne and Mum with the food prep. There were lots of laughs and I got to learn new things while we made stuff. Adrienne may have to brace herself, as she may be seeing me in the kitchen more often. I have begun to notice that when I eat a raw vegan meal I tend to tired or bored with it very quickly. The first bite will be tasty, but seven bites in I’m no longer interested, but still hungry. The poet thought about this for a moment, but he decided against it, seeing that the scientist was obviously a very bright man. He politely turned down the scientist’s offer. The poet, obviously not knowing the answer, didn’t stop to think about the scientist’s question. He took a $5 bill out of his pocket and handed it to the scientist. The bright glow quickly vanished from the scientist’s face. He thought about this for a long time, taking out his notepad and making numerous calculations. He finally gave up on his notepad and took out his laptop, using his Multimedia Encyclopedia. As the plane was landing the scientist gave up. He reluctantly handed the poet a $50 bill. This entry was posted on Monday, March 23rd, 2009 at 6:36 pm	and is filed under Raw Food. You can follow any responses to this entry through the RSS 2.0 feed. You can leave a response, or trackback from your own site.